The Crimean Karaites or Krymkaraylar (Crimean Karaim: Кърымкъарайлар Qrımqaraylar, singular къарай qaray; Trakai dialect: karajlar, singular karaj; Hebrew: קראי מזרח אירופה‎; Turkish: Karaylar), also known as Karaims and Qarays, are an ethnic group derived from Turkic-speaking adherents of Karaite Judaism in Central and Eastern Europe, especially in the territory of the former Russian Empire. "Karaim" is a Russian, Ukrainian, Lithuanian, and Polish name for the community. 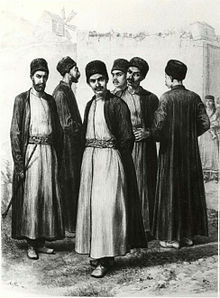 In 19th century Crimea, Karaites began to distinguish themselves from other Jewish groups, sending envoys to the czars to plead for exemptions from harsh anti-Jewish legislation. These entreaties were successful, in large part due to the czars’ wariness of the Talmud, and in 1863 Karaites were granted the same rights as their Christian and Tatar neighbors. Exempted from the Pale of Settlement, later they were considered non Jews by Nazis. This left the community untouched by Holocaust, unlike other Turkic-speaking Jews, like the Krymchak Jews that were almost wiped out. Modern Karaim resist being identified as Jews, emphasizing their Turkic heritage and claiming they are Turkic practitioners of a "Mosaic religion" separate and distinct from Judaism. Miller says that Crimean Karaites did not start claiming a distinct identity apart from the Jewish people before the 19th century, and that such leaders as Avraham Firkovich and Sima Babovich encouraged this position to avoid the strong anti-Semitism of the period. According to Crimean Karaite tradition, which developed in the 20th century inter-war Poland their forefathers were mainly farmers and members of the community who served in the military forces of the Grand Duchy of Lithuania and the Polish–Lithuanian Commonwealth, as well as in the Crimean Khanate.But according to the historical documents of the Grand Duchy of Lithuania, the chief occupation of the Crimean Karaites was usury. They were granted special privileges, including exemption from the military service. In the Crimean Khanate, the Karaites were repressed like other Jews, with prohibitions on behavior extended to riding horses. 19th century leaders of the Karaim, such as Sima Babovich and Avraham Firkovich, were driving forces behind a concerted effort to alter the status of the Karaite community in eyes of the Russian legal system. Firkovich in particular was adamant in his attempts to connect the Karaim with the Khazars, and has been accused of forging documents and inscriptions to back up his claims. Ultimately, the Tsarist government officially recognized the Karaim as being innocent of the death of Jesus.So they were exempt from many of the harsh restrictions placed on other Jews. They were, in essence, placed on equal legal footing with Crimean Tatars. The related Krymchak community, which was of similar ethnolinguistic background but which practiced rabbinical Judaism, continued to suffer under Tsarist anti-Jewish laws. Solomon Krym (1864–1936), a Crimean Karaite agronomist, was elected in 1906 to the First Duma (1906–1907) as a Kadet (National Democratic Party). On November 16, 1918 he became the Prime Minister of a short-lived Crimean Russian liberal, anti-separatist and anti-Soviet government also supported by the German army. Since the incorporation of Crimea into the Russian Empire the main center of the Qarays is the city of Yevpatoria. Their status under Russian imperial rule bore beneficial fruits for the Karaites decades later. In the 1990s, about 500 Crimean Karaites, mainly from Ukraine, emigrated to Israel under the Law of Return. The Israeli Chief Rabbinate has ruled that Karaites are Jews under Jewish law. Until the 20th century, Karaite Judaism was the only religion of the Karaim, During the Russian Civil War a significant number of Karaim emigrated to Yugoslavia, Czechoslovakia, Poland and Hungary and then France and Germany. Most of them converted to Christianity. The Karaim's modern national movement philanthropist M.S. Sarach was one of them. He made a number of other changes aimed at the Karaim's Turkification and at erasing the Karaite Jewish elements of their culture and language. He issued an order canceling the teaching of Hebrew in Karaite schools and replaced the names of the Jewish holidays and months with Turkic equivalents (see the table below). According to Shapshal, Crimean Karaites were pagans who adopted the law of Moses, but continued to adhere to their ancient Turkic beliefs. In addition, he claimed that the Karaites had revered Jesus and Mohammed as prophets for centuries. In the Post-Soviet period, Shapshal's theory was further developed in modern Karaylar publications (e.g. "Crimean Karaites legends") and was officially adopted by the Crimean Karaim Association "Krymkaraylar" (Ассоциация крымских караимов “Крымкарайлар”) as the only correct view of the Karaim's past and the present in 2000. Leon Kull and Kevin Alan Brook led the first scientific study of Crimean Karaites using genetic testing of both Y chromosomal DNA and mitochondrial DNA and the results showed that Crimean Karaites are indeed partially of Middle Eastern origin and closely related to other Jewish communities (Ashkenazi, Sephardi and Mizrahi Jews), while finding that the Crimean Karaites are genetically unrelated to non-Jewish Turkic-speaking peoples of the region. Karaim is a Kypchak Turkic language being closely related to Crimean Tatar, Armeno-Kipchak etc. Among the many different influences exerted on Karaim, those of Arabic, Hebrew, and Persian were the first to change the outlook of the Karaim lexicon. Later, due to considerable Polish, Russian, and Ukrainian influence, many Slavic and Baltic words entered the language of Polish, Lithuanian, Ukrainian, and Russian Karaim. Hebrew remained in use for liturgical purposes. Following the Ottoman occupation of Crimea, Turkish was used for business and government purposes among Karaim living on the Crimean peninsula. Three different dialects developed: the Trakai dialect, used in Trakai and Vilnius (Lithuania), the Lutsk or Halych dialect spoken in Lutsk (until World War II), and Halych, and the Crimean dialect. The last forms the Eastern group, while Trakai and Halych Karaim belong to the Western group. Currently only small minority of Karaim can speak the Karaim language (72 Crimean dialect speakers, 118 Trakai dialect speakers, and about 20 Halych dialect speakers). The most famous Crimean Karaite food is Kybyn (Russian: Кибина pl. Кибины, Karaim: kybyn pl. kybynlar, Lithuanian: Kibinai). Kybynlar are half moon shaped pies of leavened dough with a stuffing of chopped beef or mutton, baked in dutch oven or baking sheet. Other meals common for Crimean Karaites and Tatars are Chiburekki, Pelmeni, Shishlik (These are most often made from mutton). ^ Ludność. Stan i struktura demograficzno-społeczna.Narodowy Spis Powszechny Ludności i Mieszkań 2011. ^ "Gyventojai pagal tautybę, gimtąją kalbą ir tikybą". Statistics Lithuania. Retrieved January 9, 2015. ^ A. Fried, K. Landau, J. Cohen and E.Goldschmidt (1968). Some genetic polymorphic characters of the Karaite community. Harefuiah, 75, 507-509. ^ a b "Karaites of Crimea: History and Present-Day Situation in Community". Retrieved 14 April 2016. ^ Nosonovsky, M.; Shabarovsky, V. (2005). "Караимская община XVI-XVIII веков в Деражном на Волыни". Vestnik EUM. 9: 31–52. ^ Jacob Mann, "Karaica", Texts and Studies in Jewish History and Literature, no. 11, Philadelphia, 1935; Jurgita Šiaučiūnaitė – Verbickienė, Žydai Lietuvos Didžiosios Kunigaikštystės visuomenėje: sambūvio aspektai, Vilnius, 2009; Idem, Ką rado Trakuose Žiliberas de Lanua, arba kas yra Trakų žydai, in Lietuvos istorijos studijos, no. 7, 1999. ^ Кизилов М. Ильяш Караимович и Тимофей Хмельницкий: кровная месть, которой не было, (М. Kizilov. Ilyash Karaimovich and Timofey Khmelnitsky: the blood feud that never took place) Institute of Oriental Studies of the Russian Academy of Sciences in publication Фальсификация исторических источников и конструирование этнократических мифов Archived 2013-01-27 at the Wayback Machine. "Начиная приблизительно с межвоенного периода и вплоть до наших дней, караимские националисты стараются представить мирное караимское население Восточной Европы в роли "неустрашимых и храбрых воителей", что едва ли одобрили их богобоязненные исторические предки, которые были преимущественно торговцами и ремесленниками". ^ "Universitas Helsingiensis". Retrieved 14 April 2016. ^ Древние привилегии литовско-волынских караимов, извлеченные из актов замка Луцкого 1791 г"Но вникнув в смысл привилегии Витольда замечаем, что в древние времена тамошние Караимы более всего занимались заимодавством; да, и по сие время зажиточные люди этого общества не оставляют этого прибыльного промысла; и отдавая свои капиталы в рост, в обеспечение их берут у своих должников в арендное содержание мельницы, корчмы, а чаще всего ссудят под заклад движимого имущества". ^ Древние привилегии литовско-волынских караимов, извлеченные из актов замка Луцкого 1791 г"В следствие того они били челом его Королевской милости, что издавна еще при Великом Князе Витольде и при Сигизмунде и при отце нашем Короле Казимире его милости, жиды [Троцкие] (i.e Karaite Jews) никогда на войну не хаживали и не посылали". ^ Nosonovsky, M. (2011). "The Karaite Community in Derażne and its Leader Hazzan Joseph ben Yeshu'ah". Eastern European Karaites in the Last Generations: 17–35. ^ Harkavy, Albert. "Altjudische Denkmaller aus der Krim mitgetheilt von Abraham Firkowitsch, 1839–1872." In Memoires de l’Academie Imperiale de St.-Peterboug, VIIe Serie, 24, 1877; reprinted Wiesbaden, 1969. ^ Fisher, Alan W. (1978). The Crimean Tatars. Hoover Press. p. 264. ISBN 978-0-8179-6662-1. Retrieved 2009-11-08. ^ YIVO archives, Berlin Collection, Occ E, 3, Box 100, letter dated January 5, 1939. ^ Катехизис, основы Караимского закона. Руководство по обучению Закону-Божию Караимского юношества. — СПб., 1890. ^ Mikhail Kizilov. "Karaites and Karaism: Recent Developments". paper presented at the CESNUR 2003 Conference, Vilnius, Lithuania. Retrieved 14 April 2016. ^ Seraphim, Peter Heinz. Das Judentum im Osteuropäischen Raum, 1938 "...126. Das Wappen der Karaimen am Eingang zu ihrer "Kenessa" in Troki bei Wilna..."
^ Roman Freund, Karaites and Dejudaization (Acta Universitas Stockholmiensis. 1991. – №30). ^ М. Кизилов, Новые материалы к биографии Шапшала// Материалы девятой международной конференции по иудаике (2002), с. 255—273. ^ "Попытки приписать крымским караимам чуждые этнос и религию, смешение этнических крымских караимов с караимами по религии, искажение истории — оскорбляют национальные чувства и создают предпосылки для национальных и религиозных конфликтов." ("Attempts to attribute the Crimean Karaites alien ethnicity and religion, mixing ethnic Crimean Karaites with the Karaites on religion, the distortion of history – offend the national feelings and create the conditions for national and religious conflicts") Караи (крымские караимы). История, культура, святыни. — Симферополь, 2000. ^ "Караимские праздники". Retrieved 14 April 2016. ^ "Народы России - Национальная кухня крымских караимов (караев)". Retrieved 14 April 2016. ^ a b "Календарь". Retrieved 14 April 2016. Golden, Peter B. (2007a). "Khazar Studies: Achievements and Perspectives". In Golden, Peter B.; Ben-Shammai,, Haggai; Róna-Tas, András (eds.). The World of the Khazars: New Perspectives. Handbook of Oriental Studies. 17. BRILL. pp. 7–57. ISBN 978-9-004-16042-2. Retrieved February 13, 2013. This page was last edited on 19 March 2019, at 14:32 (UTC).